Professor Raghvendra Cowlagi (second from right) with graduate students Benjamin Cooper, Zetian Zhang, and Ruixiang Du. A Worcester Polytechnic Institute (WPI) professor has received an 18-month, $185,000 grant from the U.S. Air Force for research exploring how unmanned aerial vehicles (UAVs) can be operated safely, reliably, and intelligently even when they experience mechanical problems or encounter other unexpected situations. 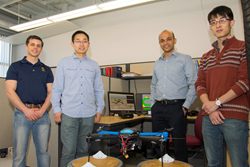 Raghvendra V. Cowlagi, assistant professor of mechanical engineering and aerospace engineering, received the grant in collaboration with Aurora Flight Sciences Corp., a leader in the manufacturing and design of optionally piloted and unmanned aircraft. The research can be applied in UAVs used in military and civilian applications, including those designed for search-and-rescue missions. UAVs are designed to fly under the control of a human pilot on the ground. However, a loss of communications and/or onboard contingencies, such as engine problems or undetected structural damage to the airframe, can impair the ability of a UAV to complete its mission. UAVs operated by the Air Force include the General Atomics MQ-1 Predator, which has a wingspan about one-quarter the size of a Boeing 747 and can carry about 450 pounds of payload. Even when communications are not interrupted, the large volumes of data transmitted by UAVs operated by the Air Force— including aircraft health, positioning, weather, and other factors—can overwhelm pilots during emergencies, making it difficult to assess the true nature of the situation. “This could lead to accidents or the aircraft may not be able to operate in an optimal way,” Cowlagi said. To address the challenge, Cowlagi and his research team are developing algorithms to run on a UAV’s onboard computer that will allow the aircraft to perform high-level missions with minimal human supervision or remote piloting, while also enabling the vehicle to tolerate severe degradation to the airframe and engines. The algorithms will also help remote pilots parse the vast amount of information transmitted by UAVs to gain a better understanding of the vehicle’s condition. Cowlagi stressed that the remote pilot will still be the supervisor, but the algorithms will take much of the burden of real-time decision making off of pilots. “A lot of the decision making that might have gone on in a pilot’s head will now go on board the UAV, and we think this will lead to safer operation of UAVs in the future,” he said. In building the algorithms, Cowlagi said his team is using a novel method based on linear temporal logic (LTL) specifications. LTL is a logic system that allows the human supervisor to command the UAV, and impose safety behaviors on the UAV, all in a unified human-friendly format. The challenge, which is being addressed by Cowlagi’s research, is to design algorithms that can ensure that the UAV diligently follows these commands from the human supervisors, while accounting for health degradations in the airframe structure and/or engines. Aurora leaders are pleased with the partnership with WPI. Other researchers working with Cowlagi on the project are graduate students Zetian Zhang, Benjamin Cooper, and Ruixiang Du, who are conducting doctoral research under Cowlagi’s supervision. This grant builds on previous U.S. Air Force–funded research Cowlagi has conducted in collaboration with Aurora. In particular, the feasibility of the current research was demonstrated in early 2015 through preliminary results obtained by Cowlagi and his team. Earlier this year, Cowlagi received a Young Investigator Award from the Air Force Office of Scientific Research for a research project focused on data-driven control for UAVs. Founded in 1865 in Worcester, Mass., WPI is one of the nation’s first engineering and technology universities. Its 14 academic departments offer more than 50 undergraduate and graduate degree programs in science, engineering, technology, business, the social sciences, and the humanities and arts, leading to bachelor’s, master’s and doctoral degrees. WPI's talented faculty work with students on interdisciplinary research that seeks solutions to important and socially relevant problems in fields as diverse as the life sciences and bioengineering, energy, information security, materials processing, and robotics. Students also have the opportunity to make a difference to communities and organizations around the world through the university's innovative Global Projects Program. There are more than 45 WPI project centers throughout the Americas, Africa, Asia-Pacific, and Europe.